BLACK REPUBLICAN BLOG: Hillary Clinton Roundly Criticized for Referring to the Unborn as a "Person"
Hillary Clinton Roundly Criticized for Referring to the Unborn as a "Person"
Mrs. Clinton, the leading Democratic presidential candidate, made the comment during an interview Sunday on NBC’s “Meet the Press” after she was asked about abortion restrictions and the rights of the unborn. “The unborn person doesn’t have constitutional rights,” Mrs. Clinton said. Presidential candidates have been struggling to discuss the sensitive topic of abortion, and Mrs. Clinton’s remarks came less than a week after Donald J. Trump, the leading Republican candidate, came under fire for saying that abortion should be banned and that women who have abortions should be punished. He later backtracked, saying that doctors who perform abortions should be punished. Then he said that the current laws should not be changed. 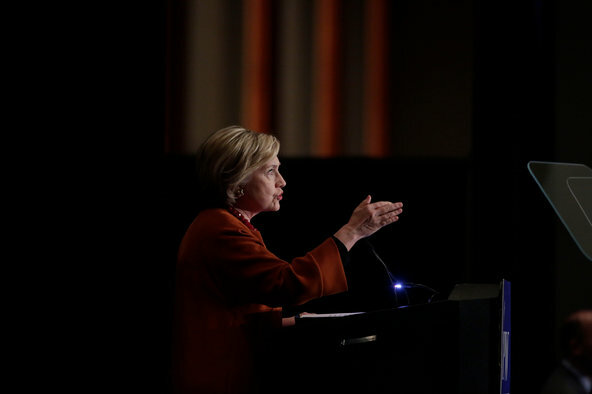 A longtime advocate of abortion rights, Mrs. Clinton is often criticized by anti-abortion groups. In this case, however, she frustrated some abortion rights supporters who said that her characterization of the unborn as a person shamed women who choose to terminate a pregnancy. Abortion opponents also seized on the remark as evidence of Mrs. Clinton’s hypocrisy, arguing that if a fetus can be considered a person then it should have constitutional protections. Rebecca Kiessling, the spokeswoman for the Personhood Alliance, which opposes abortion, said that defining fetuses as persons should mean that they are entitled to a right to life under the 14th Amendment. She considered Mrs. Clinton’s comment to be a “big gaffe” from the abortion rights perspective. Mrs. Clinton’s use of the word “person” was also seen as a rhetorical victory by those who oppose abortion and a sign that the debate was shifting in their favor.